The first public building in Saltburn was the Zetland Hotel, built by the Stockton & Darlington Railway to the designs of William Peachey, who also built the Methodist Church on Milton Street (1865) and later, as architect to the North Eastern Railway, built the gothic station at Middlesbrough. The foundation-stone of the hotel was laid by Thomas Dundas, 2nd Earl of Zetland (1795-1873), from whom the land for the whole town was bought, on October 2nd 1861, and the hotel opened on July 27th 1863. In its situation it’s strongly reminiscent of the Grand Hotel at Scarborough, but its Italianate styling is much lighter than Cuthbert Brodrick’s magnificent bombast. The circular turret above the central bay of the Zetland was initially equipped as a telescope room. So strong was the connection – through the Pease family – between the railway and the resort that the station platform was extended so that the buffer stops stood within feet of the back door of the hotel. A covered train-shed protected passengers as they left the train and entered the hotel without discomfort whatever the weather. 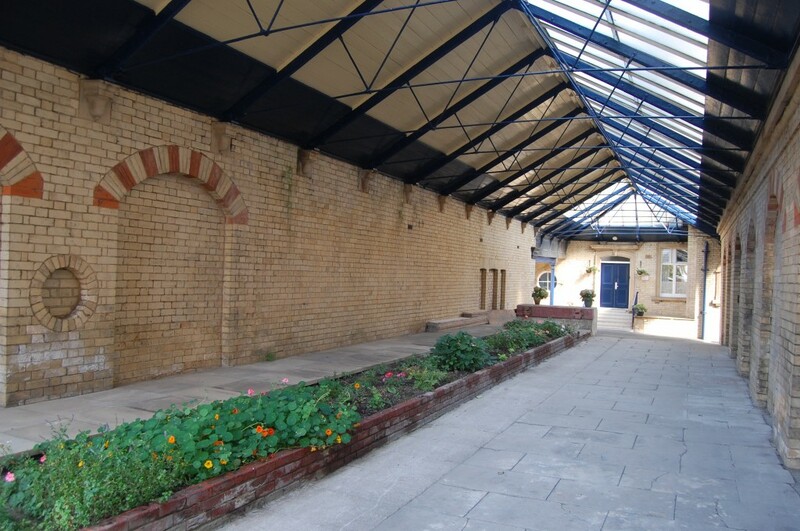 The stable block, incorporating coach-houses and accommodation for livery servants, was designed with an imposing blind arcade facing Milton Street. The hotel eventually closed in 1989 and was later converted into an apartment block. The Milton Street stables building is now adapted as housing also. This entry was posted in Fun Palaces, Victorian Architecture, Yorkshire's Seaside Heritage on October 31, 2014 by Mike Higginbottom. Saltburn-by-the-Sea is a classic example of a Victorian holiday resort built at the end of a railway line. Its site was a bare cliff-top until Henry Pease, the Quaker son of the founder of the Stockton & Darlington Railway, came upon it in 1859 and – in his wife’s words – saw, “in a sort of prophetic vision, on the edge of the cliff before him, a town arise and the quiet unfrequented glen turned into a lovely garden”. Henry Pease, with his brother, nephew and numerous other S&DR personalities and figures in the local iron industry, formed the Saltburn Improvement Company in 1860, in anticipation of the opening of the railway. The foundation stone of the first building in the new town, a row of six railwaymen’s houses named Alpha Place, was laid on January 23rd 1861. Passenger trains began to run on August 17th that year, at which time not even Alpha Place, apparently, was finished. The Improvement Company held a competition to obtain a street-layout, and commissioned from the winner, George Dickenson of Darlington, a plan which is still the framework of the town centre. Parallel to the railway which bisects Saltburn, to north and south, run Milton Street and Dundas Street, with the “jewel” streets (Amber, Pearl, Diamond, Emerald, Ruby and Garnet) grouped between Milton Street and the Marine Terrace, and the “river” streets (Eden, Leven, Tweed, Lune, Avon and Greta) running roughly at right-angles to Albion Terrace which overlooks the valley of Skelton Beck. Alpha Place was demolished because it conflicted with Dickenson’s alignments. The Saltburn Improvement Company kept strict control over building standards in the town, insisting on uniform rooflines, though allowing some freedom in architectural detail, and specifying for all frontages the use of a white firebrick which was, perhaps predictably, obtained from Peases West Brickworks in Co Durham. The prices of plots were fixed on a scale which placed obvious value on sea and valley views, and on commercially valuable sites in the centre. Plots on the Jewel Streets cost around half as much as those on the sheltered sites looking across the valley (5s 6d as opposed to 10s 6d). Economic depression in 1873-5 halved the price of Cleveland iron-ore, and effectively halted the planned development of Saltburn. The Assembly Rooms, designed for the plot at the south end of Britannia, was never started. Britannia Terrace itself was never finished. The Improvement Company was wound up in the early 1880s after passing its responsibilities to a local Board of Health and the Owners of the Middlesborough Estate. No longer did buildings in Saltburn have to be faced in Peases West brick, and the distribution of this pale, unlovely material illustrates as clearly as a snapshot how far development had gone by about 1875. This entry was posted in Fun Palaces, Victorian Architecture, Yorkshire's Seaside Heritage on October 28, 2014 by Mike Higginbottom. Lowestoft divides neatly into a northern shopping area and a southern resort area, separated by the swing-bridge over the harbour approach. All this results from the initiative of Samuel Morton Peto (1809-1889), the great civil engineer and entrepreneur, who had moved into Somerleyton Hall, a few miles west, in 1844. 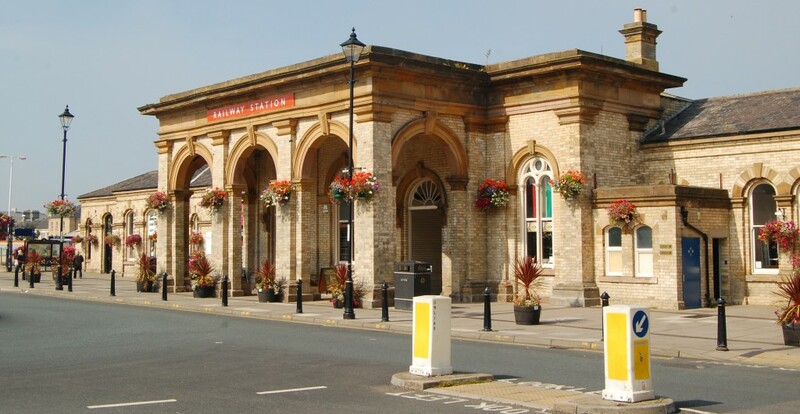 When the Norfolk Railway was built to connect with Peto’s Lowestoft Railway & Harbour Company’s docks in 1845, its terminus was a mile and a half from the existing settlement. The town stretched southwards as its population grew during the nineteenth century. 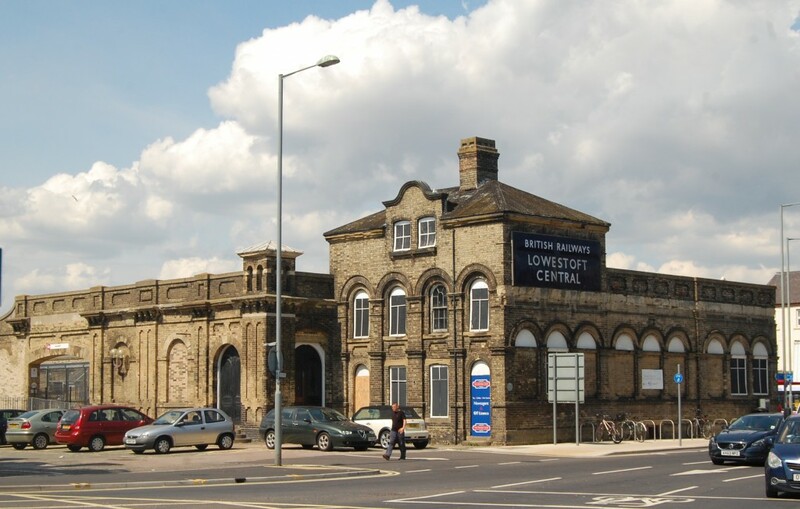 To this day, Lowestoft Central railway station sits absolutely in the centre of the town. It became Central after the Norfolk & Suffolk railway opened Lowestoft North in 1903. Though the “Central” epithet was dropped in 1971 after Lowestoft North closed, the building still carries an enamel sign with the words “British Railways Lowestoft Central” – one of the few such still in situ anywhere in the Britain. The station was stripped of its platform awnings in the late 1960s and the heavy timber roof of the concourse disappeared in a 1992 modernisation, leaving passengers to wait for the surviving services to Norwich and Ipswich in a windy circulating area open to the skies. Arguments about redevelopment of the station’s public areas and the streetscape surrounding it have been running since 2010. The Waveney District Council initially advocating moving the rail lines back so that the surviving historic buildings could be used for commercial development; Network Rail took against that, having been caught out at Cromer and elsewhere in East Anglia, because it would hide the rail operation from passers-by. Discussions continue amid piecemeal improvements to the surrounding infrastructure: http://www.peteraldous.com/content/aldous-calls-improvements-lowestoft-train-station. Whatever results won’t look much like Central Station as it existed until the 1990s, but the station continues to be staffed and heavily used, and there are sufficient historic structures to provide better amenities. Lots of places have to put up with a couple of bus shelters. This entry was posted in Victorian Architecture on October 22, 2014 by Mike Higginbottom. Arnos Vale Cemetery in Brislington, Bristol, is a superb example of an 1830s company cemetery laid out as an Elysian landscape with fine classical buildings and a rich collection of monuments up to and including the past decade. The cemetery was designed by the Bristol architect Charles Underwood (1791-1883) and the landscaping, including two thousand ornamental trees and shrubs, was the responsibility of the local nurserymen James Garraway and Martin Hayes (c1801-1858). The cemetery opened, after the consecration of the Anglican chapel by the Bishop of Gloucester and Bristol, in October 1840. Successive extensions were added from 1855 until the time of the Second World War. Because military hospitals were concentrated around Bristol in the First World War soldiers and seamen who were wounded in action and died after repatriation came to be buried at Arnos Vale. All these graves are maintained by the Commonwealth War Graves Commission. To maintain income in the face of changing fashion, the cemetery company built a crematorium, cloister and columbarium, designed by H G Malcolm Laing, around the nonconformist chapel in 1927-9. This was for a time the only crematorium in the South West, and attracted business from far into Devon and Cornwall. Latterly, the equipment became superannuated and was maintained only with difficulty. By the 1970s the physical and financial condition of the site caused considerable concern, and it took until 2003 for Bristol City Council to take ownership. It is now maintained by the Arnos Vale Cemetery Trust and reopened to the public in May 2010. 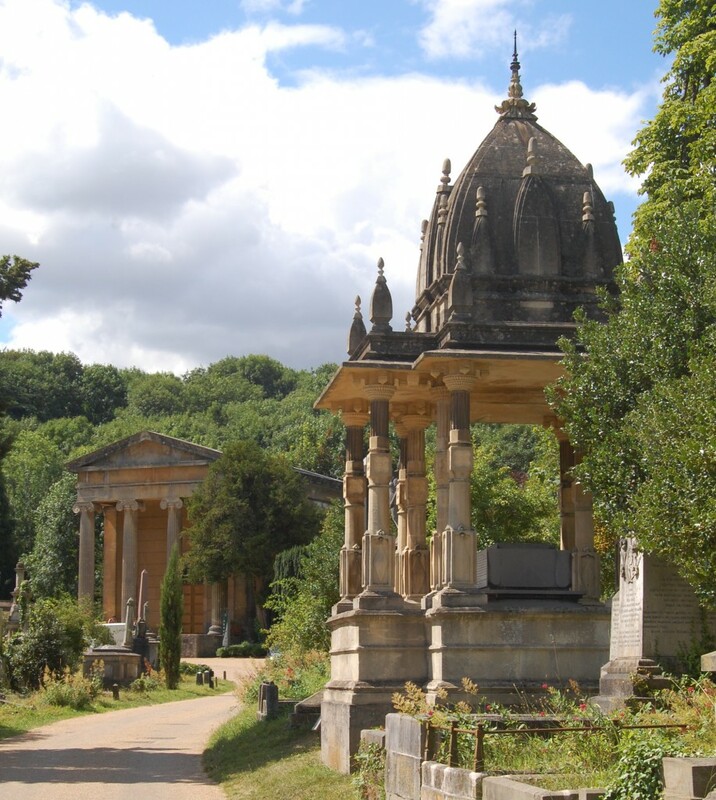 Under its new ownership, Arnos Vale has become distinctive among restored Victorian cemeteries for promoting its buildings and amenities. With lottery grants and other funds the lodges and the two chapels have been fully restored: the Anglican chapel is available for religious wedding ceremonies and the Nonconformist chapel is licensed for civil ceremonies: http://www.arnosvale.org.uk/cemetery-services. At first it may seem odd to get married in a cemetery, but what could be more appropriate than to commit to a life partner – or, for that matter, to name a child – in the presence of ancestors? And on a daily basis, the tactful glass extension of the Nonconformist chapel provides a superb café, operated by Whisk!, a highly regarded firm of Bristol caterers, where visitors can unwind in glorious Elysian surroundings: http://www.arnosvale.org.uk/atrium-cafe. A visit to the basement loo provides an opportunity to see the workings of the catafalque and relics of the former crematorium. The Atrium Café is open every day except Christmas Day and New Year’s Eve. There’s an attractive account of Arnos Vale by the son and grandson of successive superintendents at http://www.theguardian.com/lifeandstyle/2015/oct/30/experience-i-grew-up-in-a-cemetery?CMP=Share_AndroidApp_Gmail?CMP=Share_AndroidApp_Gmail. This entry was posted in Cemeteries, Sewerage & Sanitation, Victorian Architecture on October 16, 2014 by Mike Higginbottom. The prototype of the last generation of conventional rear-entrance double-deck London buses is RM1, the very first Routemaster, built in 1954 and brought into use after various modifications in 1956. It still exists – and runs – in its 1960 condition at the London Transport Museum’s Acton Depot: http://www.ltmcollection.org/vehicles/objects/object.html?IXtype=&_IXSR_=UnPctRYPqQC&_IXMAXHITS_=1&_IXFIRST_=20&_IXSESSION_=. When you’ve seen one red bus you may feel you’ve seen them all, but this design was special. Conceived after the war, when the London Transport RT type was in production, the Routemaster was custom-designed for service in the capital. Its designers, Arthur “Bill” Durrant, Colin Curtis and Douglas Scott, set out to supersede the RT, so the Routemaster was built of aluminium, three quarters of a ton lighter than the RT, with independent front suspension, a fully automatic gearbox and more powerful brakes. It seated 64, eight more than the RT. It was intended to make the most of London Transport’s innovative Aldenham Bus Works, which ran a production-line overhaul system to inspect, refurbish and test vehicles in the shortest possible time. 2,876 of these splendid buses were built and nearly half of them still exist. Their sturdy construction and sound design meant that, despite their disadvantages of limited capacity and accessibility and the need for two-man operation, they outlasted newer vehicles and remained popular with passengers and crews. It’s no accident that the New Routemaster, [http://www.tfl.gov.uk/modes/buses/new-routemaster] sponsored by the Mayor of London, Boris Johnson, has earned a place on the streets of 21st-century London: six hundred of them will be in service by 2016. This entry was posted in Transports of Delight on October 10, 2014 by Mike Higginbottom. The London Bus Museum [http://www.londonbusmuseum.com] at Brooklands, Surrey, exists to chronicle the development of the London bus from the earliest days of horse-drawn buses to the end of the twentieth century. 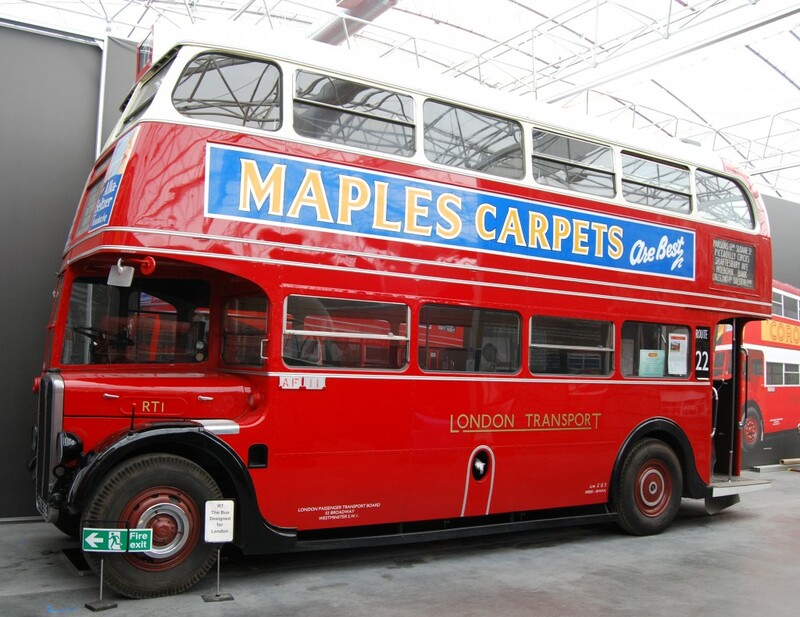 One of its most treasured exhibits is RT1, dating from August 1939, the prototype of nearly seven thousand classic post-war London double-deckers. Its diesel engine, air brakes and pre-selector gearbox made it easy to drive and comfortable to ride. It stands in a line of development that was pioneered by the London General Omnibus Company and its manufacturing arm, the Associated Equipment Company [AEC], that shed the horse-bus ancestry of early motor buses and was continued after the formation of London Transport in 1933 by the design-conscious CEO, Frank Pick (1878-1941), who insisted that every possible aspect of London’s public transport operations should be elegant and attractive. RT1 remained in LT ownership until 1978, was sold for preservation and got into various scrapes, including time in the USA, before being scrupulously restored to 1939 condition at a cost of over £200,000. 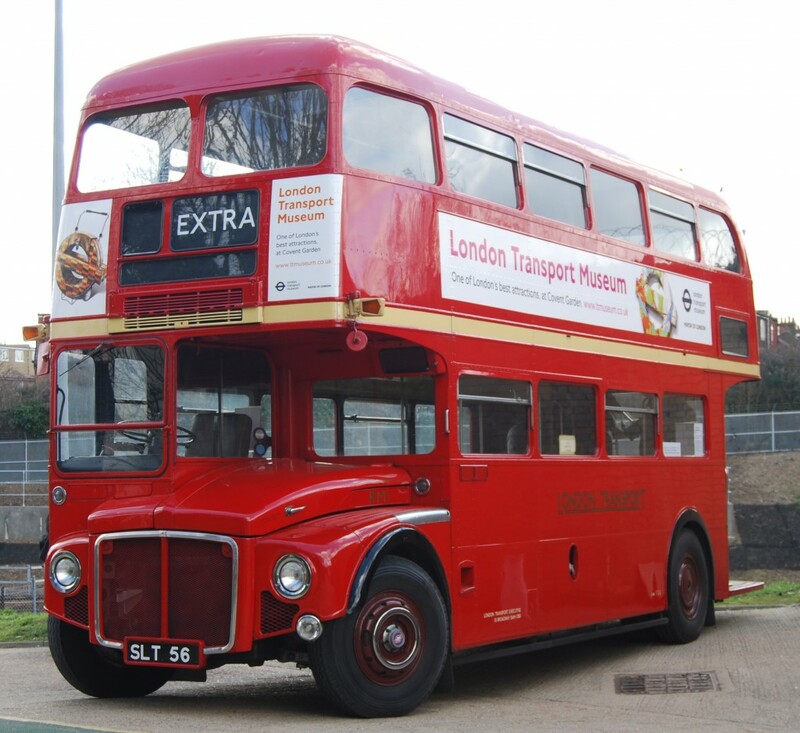 The London Bus Museum acquired it in 2010 and displays it in a clear chronological sequence of vehicles dating from the mid-1870s to 1979. This entry was posted in Transports of Delight on October 5, 2014 by Mike Higginbottom.